Bundesministerium für Bildung und Forschung (BMBF), organized a presentation session to give us an overview of who they are and what their mandate is. Due to the many global challenges the world has been facing (from climate change to urbanization, to environment pollution, to resource degradation etc. ), BMBF started improving the international research and innovative partnerships. Three of the main goals is the establishment of a long-term cooperation with other countries and the promotion of specifically selected research areas of the high-tech strategy, as well as the enhancement of the visibility of Germany as an outstanding research location. Currently, they are cooperating with many African and Asia countries countries. As some BMBF representative reported, the Ministry has a fund of 350 millions euros to be allocated by 2019. 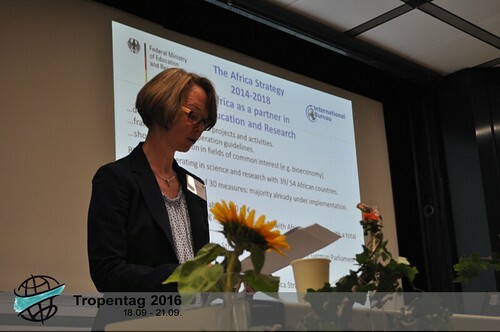 In 2016, they have funded about 300 projects together with African partners with a total budget of about 60 million euros, promoting the research in the area of health and medicine and climate change, energy and food production. As a young crop scientist, I found it would worth being part of the attendants in the crop biotic stresses oral presentations this morning, Tuesday 20th. And I do not regret it. Most of the projects were from East-African Universities in collaboration with European or South-Americans Universities. They embraced applied research dealing with production, formulation and application as well as efficacy testing under field conditions, as well as basic research focusing on bio-control mechanisms studying molecular interactions between the BCAs and their prey. Ah, how modern is to say that biological control with beneficial microorganisms (BCAs) can be used to fight plant diseases! Biological control indeed plays an important role, now and even more in the future, as many pesticides are being faced out and organic and Integrated Pest Management (IPM) production is encouraging aiming at improving sustainable plant production. One of the young scientists, the Ph.D. student Mary Musyoki from Hohenheim University, Germany, gave a wonderful presentation on bio-control using Fusarium Oxysporum f.sp. Strigae-its impact on beneficial indigenous prokaryotes in a maize rhizosphere. “We experienced the success of bio-control agent in a greenhouse lab and we had to release it into the fields to evaluate further”, Musyoki said. However, she mentioned also that risk assessment analysis of having it as a biological control agent in soil ecosystem is vital, it's been proved and it’s now ready for registration. Having long heard about YPARD, I felt the need to join them during at their participatory discussion. "Young Professional for Agricultural Research and Development", well known as YPARD, organized an interactive workshop this Monday morning on the theme "Mission 2026: acting now to support youth in agriculture". They posed a most important challenge: when looking back, what actions will the youth of tomorrow wish today´s environment-custodians had taken in order to improve the agricultural sector of 2026 and their place on it? Student Reporters -"Countdown to Tropentag 2016"
The annual Tropentag conference is back again this year in Vienna,Austria with the topic "Solidarity in competing world_fair use of natural resources".This international conference has attracted more than 800 researches,policy makers,early career scientists and students in the field of agricultural sciences,rural development and natural resources from different countries all over the world.